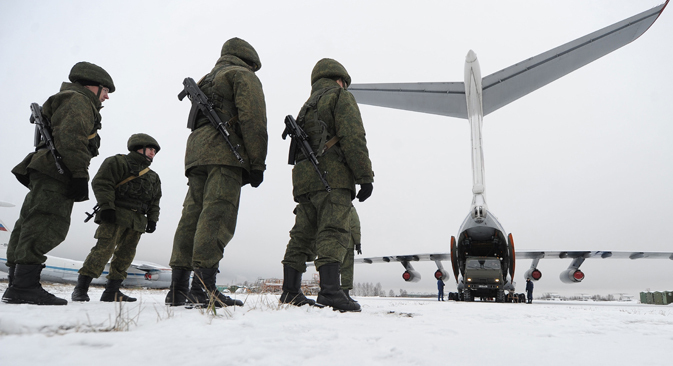 The surprise combat inspection of the country’s western and central military command will involve all wings of the Russian armed forces with over 150,000 personnel taking part. Although not connected to the drills, the developments in Crimea are being closely monitored by the Russian Defence Ministry. On Wednesday, February 26 Russian President Vladimir Putin ordered a surprise comprehensive inspection of the combat readiness of the Russian armed forces in the Western and Central military districts. Apart from the forces stationed in these two districts, troops of the Aerospace Defence service, the Airborne Troops, and the Long-Range and Transport Aviation were put on combat alert. The previous drills were announced by the commander-in-chief on the night of July 13, 2013. They involved more than 80,000 troops in the Eastern Military District. That was the largest surprise event of its kind since 1991. According to Defense Minister Sergey Shoygu, more than 150,000 personnel are involved in the drills, as well as around 90 planes and 120 helicopters, up to 880 tanks, 1,200 units of other military hardware, and about 80 warships. He said that all the tanks will be firing live rounds, aircraft will fly out on combat missions, and there will be a mass landing of airborne assault troops from helicopters. The Defence Ministry (MoD) says the main objective of the drills is to test the Russian armed forces' combat readiness. “Over the previous year we improved indicators such as the state of repair of the MoD's military hardware, and the numerical strength of military units was brought closer to its nominal levels,” Shoygu said. Shoygu emphasized that the sudden drills are not linked in any way to the political crisis in Ukraine. “Regardless of events in other parts of the world, we need to think every hour of every day about the Russian armed forces’ combat readiness,” said Deputy Defence Minister Anatoliy Antonov. He added that the drills had been planned a long time ago, and he saw no need to change the timing. At the same time, the Russian MoD is closely watching the developments in Crimea, where the Russian Black Sea Fleet is stationed. “We are taking steps to ensure the security of the Black Sea Fleet’s facilities, infrastructure, and weapons depots,” Antonov said. He explained that the drills will be taking place in the vicinity of Russia's borders with other countries, including Ukraine. He said that if such drills were to be held near the border with Finland, that would hardly have caused any suspicions or speculation in the media. The drills will be held in two stages from February 26 to March 3. The troops taking part will return to their bases by March 7.